– 2 small brake line extensions, with fittings on both sides. $2.29 a piece. – About a foot and a half of small vacuum hose, or better yet clear hose, has to be smaller than the diameter of the brake line. – knife or something to cut the brake line. – A clamp or a helper to hold the hoses into the reservoir. 1. Install the brake line fittings into the master cylinder. 3. Attach the hoses to the ends of the lines and cut them so that the reach just to the bottom of the reservoir, and clamp them onto it so they dont move. Now if you have a vise, clamp the master into it, if not, you can use a counter top and place the master against the wall for support. Bob Hewitt wrote: Fill the reservoirs with new brake fluid, and pump the piston slowly and evenly, full strokes. I used a big Phillips screwdriver because its tip doesn’t damage the piston and the handle gives you something to lean against. I would not worry about the fluid getting recirculated because it is brand new and you are creating a temporary hydraulic circuit with the hoses which will not become contaminated with dirt. The air which is still in the system at this point will be bled out. 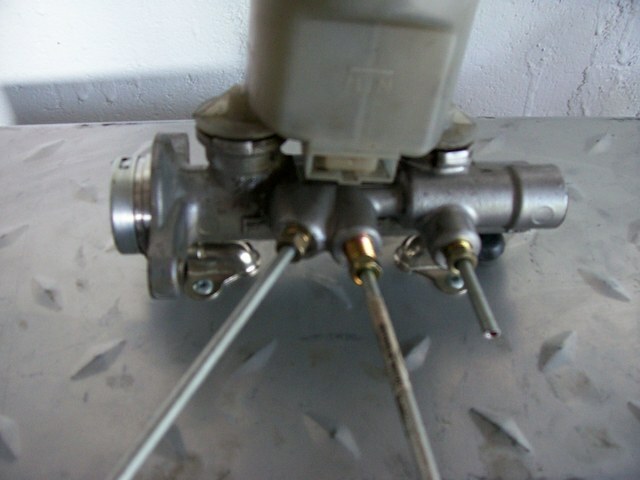 Pump the cylinder until the tubing contains no more air bubbles and no new ones emerge from the MC on the down stroke. On my MC this took about 15 strokes some may require more, some less. Keep going until the air stops as this will make the task of bleeding the brakes in the car much simpler. When all the air is out, mount the cylinder in the car. Here you have to be careful to prevent the fluid still in the hoses from spaying your car and any other painted objects nearby – brake fluid is a great paint remover! If you decide to remove the hoses before installing on the car, make sure to plug up the fittings – I just held the hoses up while transferring from bench to car. 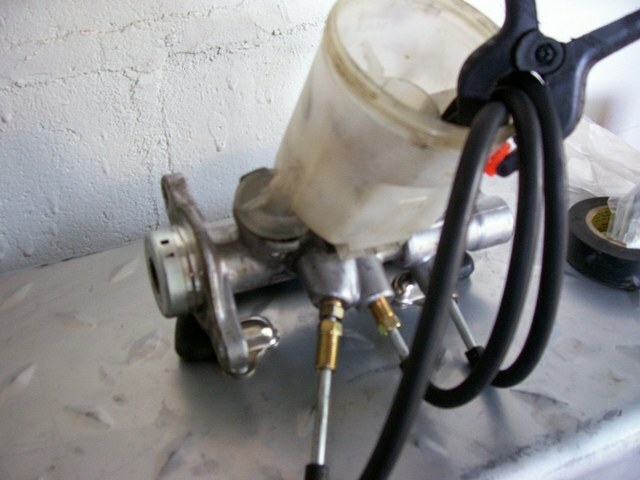 Once the MC is mounted in the car, remove the fittings and connect the brake lines. 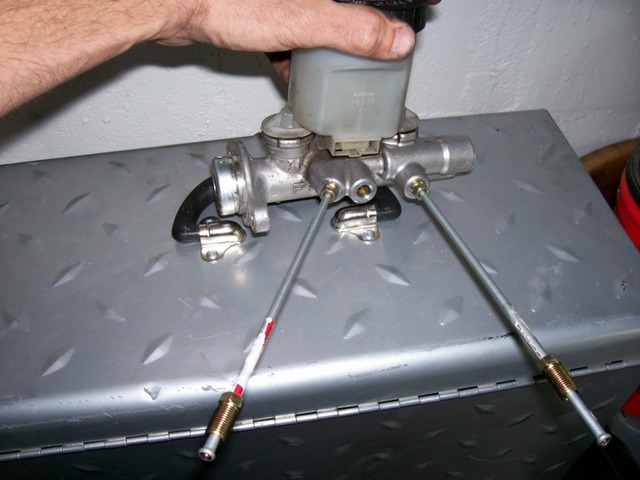 You’ll lose a little fluid but the check valves in the cylinder should stop any major leakage. Now you are ready to bleed the brakes in your car and it should be a lot easier than if this step was avoided.